Dr. Andrew Palmer, assistant professor of biological sciences, heads the RADISH project to study plant growth on Mars. On the second floor of the Florida Tech Olin Life Sciences Building, tucked away in what looks like an old refrigerator, is the beginning of the next great human journey into the unknown. To look at it, the research seems pretty simple. There’s a chamber – that looks like a refrigerator – fitted with some special lighting and filled with trays of tiny seedlings. Nothing earth-shattering there. But things aren’t always what they seem. This growing chamber holds peas and lettuce plants. Just the beginning of Florida Tech’s research in partnership with NASA to study Mars regolith simulant. This project, Research to Advance the Development of Integrated Space Horticulture (RADISH), is actually the first of its kind to test and document plant growth in Mars regolith simulant to better understand in situ resource utilization. Uh, excuse me? Come again? Told you it wasn’t that simple. Before we get too far along here, how about a crash course in Mars terminology? “Martian regolith” is Mars dirt. Since we don’t actually have any Mars dirt here on Earth, researchers have to use the next best thing, which is “regolith simulant.” This is volcanic soil from Hawaii. “In situ resource utilization” is learning how to live off the land in space. To put it simply, a team of Florida Tech professors and undergraduate astrobiology students are working in partnership with NASA to figure out what it will take to grow food on Mars so future explorers will have something to eat. If you’ve ever tried to haul a bag of potting soil into your cart at the hardware store, you’ll understand why researchers are so keen on using as much of the natural resources as they can. Dirt is heavy, and weight is an issue when you’re launching people and other supplies to Mars. We’ll have to travel light. That’s where RADISH comes in. Though regolith simulant is available for anyone to purchase online, and other commercial groups are using it, this project already has more recorded data than any other group that’s worked on the subject. The right people just happened to be in the right place at the right time, to make the project a reality. “It was a collision of circumstance between our new planetary science undergraduate program, the establishment of the Buzz Aldrin Space Institute, the acquisition of a Mars simulation chamber from NASA-KSC and renewed media and government interest in going to Mars,” Batcheldor said. Dr. Andrew Palmer, assistant professor of biological sciences, and Dr. Brooke Wheeler, assistant professor in the College of Aeronautics, worked together to design and plan RADISH. 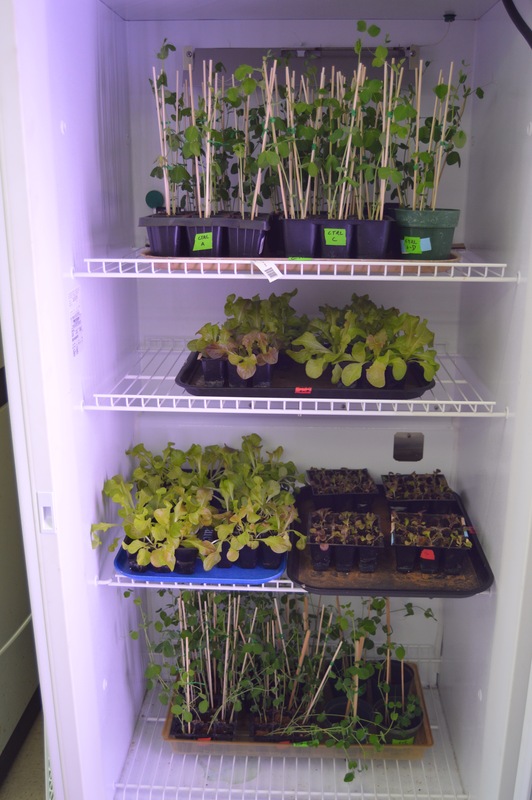 Preliminary research started over the summer with a variety of lettuce plants grown in regular potting soil, regolith simulant and simulant with added nutrients. These trays of lettuce were grown in a chamber in a controlled lighting and temperature setting. Since the first lettuce planting over the summer, they have since added peas, tomatoes and peppers, as well as a second chamber. David Handy, Brianna Richardson and David Masaitis, all undergraduate astrobiology students, volunteered to assist in the research. The project has become a unique experience for the undergrad volunteers. Not only does Florida Tech have the only astrobiology undergrad program in the country, but giving undergrads the opportunity to assist in this kind of research is nearly unheard of. The fact that the research findings will be reported directly to NASA, ads a whole other dimension to their work. So far, other than Hurricane Matthew shutting down the school for a few days, the research has gone smoothly. The team also doesn’t have any other documented studies from which to base their research going forward. They literally are writing the book on in situ resource utilization with Mars regolith simulant. Looking at the food options for Mars and determining which plants have the greatest chance for success is all part of phase one. Phase two will be to try to engineer existing bacteria to make the necessary nutrients needed for maximum plant growth. Fertilizer is just as heavy as soil. So whatever the Mars dirt is lacking, will need to be manufactured remotely on the planet. The ultimate goal is to prepare the Mars regolith and grow crops before the first explorers ever arrive. This is why RADISH is so important. Sustainability on Mars is just the first step. If humans can’t grow food, the rest of the mission is futile. From sustainability research here at home to farming on a distant planet, a lot can be learned from a few plants in a refrigerator.